This time it would be different. 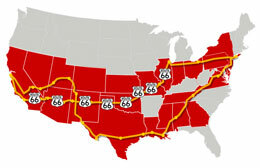 After outlining our basic itinerary, it became clear that we would be camping out for between 21 and 28 days. And the campsites would vary from large, well-equipped campgrounds to truly remote, primitive backcountry locations with zero facilities. At many sites we would be able to camp right next to our jeep, but there were a few places where we would have to “hike in,” carrying our gear to interior backcountry campsites. Yes, it was time to get a “grown-up” tent. No more $29.99-special-on-sale-at-walmart tent, we would have to invest in a high-quality shelter with zippers that don’t get stuck and seams that don’t leak. Oh, and maybe something a bit bigger than the “four-man” tent that could barely fit us — two women and a 10-year-old — the last time we went! Initially we thought about getting two smaller tents (which would be lighter, and give us some additional space, but require double set-up) rather than one BIG tent (which would necessarily be heavier). Then we refined the idea into a “big+little” option. The “big” would be the principle tent, something really solid that we could stand up in, and where the three of us could sit out the rain comfortably for a stretch. It should be well-made, really water-proof and with a profile that will not easily be blown over. However, this would not be something we could easily carry to “backpack” hike-in sites, nor would it likely be really quick to put up and take down. That is where the “little” will fill in. A smaller, lighter tent, similar to the kind we have always used, it will be easy to put up and take down and light enough to carry. As we will not be using it every night, it won’t matter if it is a bit of a tight fit, or if the zippers are troublesome. The only “negative” or “concern” we had about this tent is related to its weight (if we decided to use it for the Hike-In sites) — at almost 27 pounds it is relatively heavy (can be carried by one person, but that person couldn’t carry anything else, so we would have to split remaining gear between two of us). The one concern we had related to reviews. Some reviewers complained about leaks, whereas the Copper Canyon reviews spoke about “no leaks” — not sure if it is just a difference in people’s experience or if there is some difference between the quality of the tents, but it influenced us, and we chose to go with the Copper Canyon. For the “little” tent we had many options. Ideally we would each have one of those personal back-pack tents, that weigh next to nothing and roll up smaller than a sleeping bag. But they are quite expensive — the best price we saw was around $90 each — and as we needed three, and only for a few days of the journey, it didn’t really seem like a viable option. Then, a friend suggested we get one of those “2 second” Quechua tents, which you basically can just toss out on the ground and they pitch themselves. 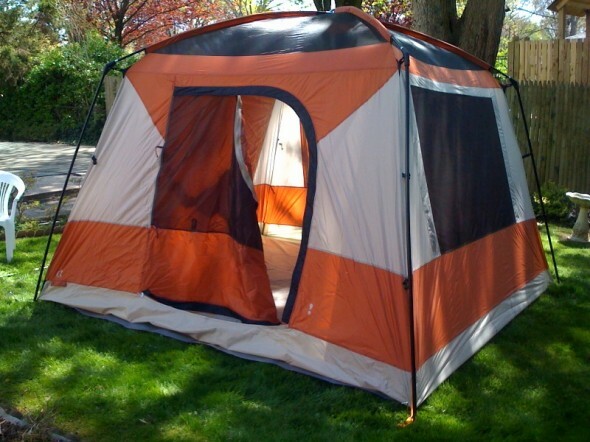 They were very reasonably priced at the Decathlon store in Paris, where they also had this amazing Base 4.2 tent. The most practical was the “2 Second” tent — the “one-man” version is very light, and a larger “three-man” version is not that much heavier. The only drawback is these tents fold into big round discs, which is fine in the back of the Jeep but is much less practical in terms of carrying them on a hike. 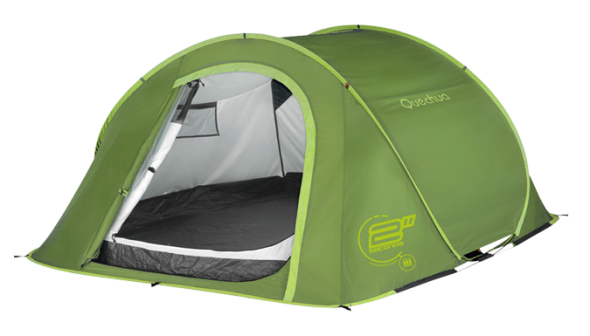 The Quechua tent had a good Gear Junkie review and also the comments from folks at ukcampsite were quite helpful, as they had used the bigger version of the tent. We decided on the “3-man” Quechua 2-Second tent for our “little” backcountry option. On the first day that it was nice enough outside, I took out the big tent to seal the seams and also to see how long it would take to put it up for the very first time (figuring that as we learn how to do it, it will go much faster). I started at 11:04am and had it up by 11:43am — all by myself! It went up really easily, with only a minor difficulty getting some of the little metal pegs into the bottoms of the wall poles. When we would be doing it as a team it would go up in about 20 minutes, max — even when we have been driving all day. Seeing it pitched on the lawn, I felt sure it would make a very pleasant shelter. It is really roomy (I swear it is bigger than some studio apartments I have lived in! — especially in New York City!) and the windows everywhere are GREAT! It also has a skylight that would let us see the stars at night without having to actually sleep uncovered! It seems like a lot of thought went into the design. Overall I think we made a good choice. The windows and skylight make it very comfortable inside — and we can configure them in a lot of different ways to maximize airflow while maintaining some cool shade. The zippers seem to be pretty good quality, and the whole thing seems sturdy. It looks like it will hold up for the duration of the trip, if we are somewhat gentle with it (and we will still have duct tape handy in case of emergencies)! This entry was posted on Saturday, July 3rd, 2010 at 9:05 am. It is filed under The Great Outdoors and tagged with camping, equipment, logistics, planning, preparations, tent. You can follow any responses to this entry through the RSS 2.0 feed.